Gert,this flower bun look so cute!! I like the way you twist the flowers!! I also use the bun mix to make boa the other day.This boa mix really good and soft! WoW! This is so fantastic... I love Steamed Bun with Tung Po meat too... thanks for the recipe! I haven't seen buns of such design before. They look really cute! Ahhh...so this is how it was made. Thanks for the pictures, hopefully next time I can shape a successful flower buns. Look so pretty! Wonderful! Glad to see you putting your name on your photos. Mine were stolen and reused. Looks so beautiful! I always wonder how it's shaped. Yum Gert... Flower bun looks good. 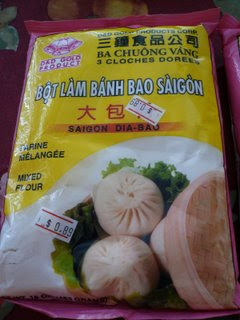 Nice to dip with sauce from Tong Pou Yoke..
Lesley, thank you. Yea I too love the ready mix flour. Bit of taste, you are welcome. Noobcook, this plain buns is really good to dip into stew meat or even curry. LCOM, it's not difficult once you get the hang of it and thank you. Dawn, someone stole some of my pictures and made it their own. I am so fed-up of them. Cool!! Never seen these!! Well done! Can you tell me a bit more about the mix? What it is actually called so I can look for it? Our local store is Korean and the staff are not helpful in any way so unless the Hispanic stock boys know what I mean, I'm outa luck. Maureen, I will post a picture of the mix here for you to see. Gert. Your flouwer buns looks so adorable. I tried to make it, but it did not turn out like yours. For some reasons I can't get the same twist. How did you do it?